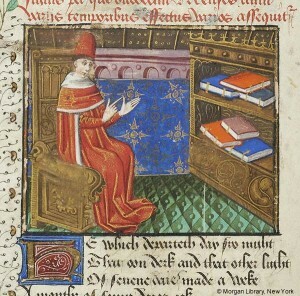 The Index houses its own research library of nearly 6,000 publications in medieval studies and art history. This non-circulating collection is open to all visitors during regular hours. Organized by subject matter, the Index library collects research material including manuscript studies, architecture, painting, stained glass, sculpture, decorative arts, and medieval history. Areas of strength include Early Christian and Byzantine studies, which were augmented significantly in 2012 by the generous donation of book and journals that belonged to our Index colleague Lois Drewer. A full set of Index publications are available for your consultation as well as extensive print collections of Gesta (1963-) and Studies in Iconography (1975-). The Index maintains a valuable section of reference works including various dictionaries and encyclopedias pertaining to medieval studies, exhibition catalogues, books on medieval liturgy and hagiography, including 76 volumes in-folio of the Acta Sanctorum, and many Blue Guides. The Index is also home to an archive of material relating to the history of the Index of Christian Art and the people who have worked here. Much of this material concerns the career of Index founder Charles Rufus Morey (1877-1955), including books, papers, offprints, and study photographs. This small in-house archive records almost one hundred years of the history and methodology of Index work. Thematic exhibitions of this material are frequently on display in the entrance of the Index. These and other exhibitions are announced on the Index blog.